The right facility, infrastructure and services to hose your event. A venue with the location, accessibility and destination attributes at attract attendees. With two modern exhibit halls that can be configured or combined any way you want, the MassMutual Convention Center will fulfill all of your exhibition goals. Designed with the needs of both the Convention Planner and attendees in mind, our halls offer 40,000 square feet of continuous space boasting 27’ ceilings that offer a wide range of opportunities for planners. 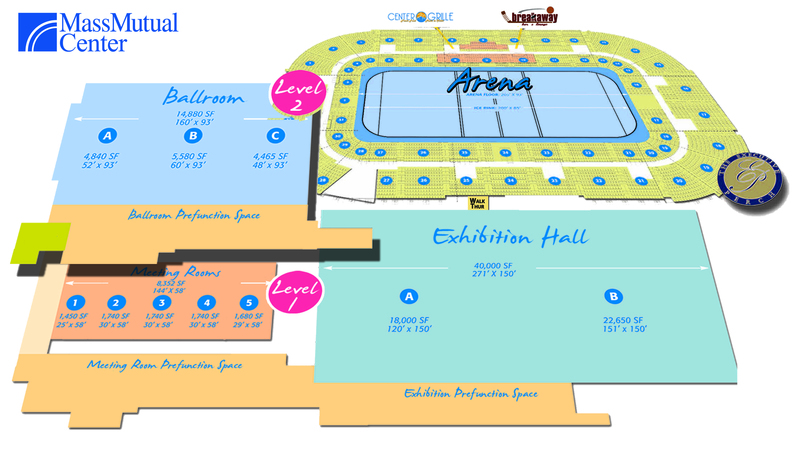 The exhibit halls are flexible enough to accommodate a special session or meeting right on the show floor all the way up to a medium-sized or large corporate event, association event or tradeshow. The MassMutual Convention Center Meeting Rooms at Event Level allow you easy access to the Exhibit Space. We offer 8 spacious rooms totaling over 24,500 square feet that can be used separately or divided into segments to fit your event needs. The Meeting Rooms are steps away from the pre-function registration area. You can use the rooms to hold meetings with easy access to the Exhibit Halls, or to set up your show offices with direct proximity to the exhibits. The MassMutual Center’s 15,000 continous square foot Grand Ballroom is Western New England’s largest ballroom—a perfect setting for your banquet, general session, or entertainment. It can accommodate up to 1,500 people, or you can choose a customized layout for a more intimate event. The elegant room can be subdivided in half to support two simultaneous presentations or host a meal function on one side and a general session on the other. Built-in technology fulfills the most ambitious AV requirement. There’s even a Green Room for your speakers or entertainer.